previous experiments as a student. Exemplifying Drysdale’s skill as a draughtsman, the painting also confirms the importance of the figure in his work throughout his career. 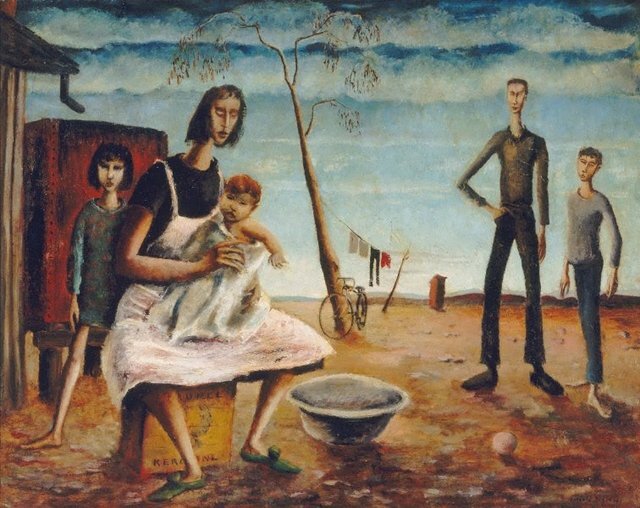 Inspired by the empathy he felt for country people during the Depression, Drysdale depicted what he saw as the uniquely Australian qualities of life on the land. His approach in Sunday evening is influenced by fellow Australian artist Peter Purves Smith, by surrealism, and by the School of Paris artists Modigliani and Soutine. Drawing on these influences, Drysdale evolved his own distinctive vision of human existence on an ancient continent.